The Carter Center launched its fourth election observation mission in Guyana at an important time in the country's history. For many years, politics in this small South American country have fractured along ethnic lines. The People's National Congress, supported mostly by Afro-Guyanese whose ancestors were brought to the country as slaves, held sway during much of the 1970s and '80s. The People's Political Party, whose core supporters are Indo-Guyanese descended from South Asian indentured servants who arrived in the country more than 100 years ago, has been in power since 1992. 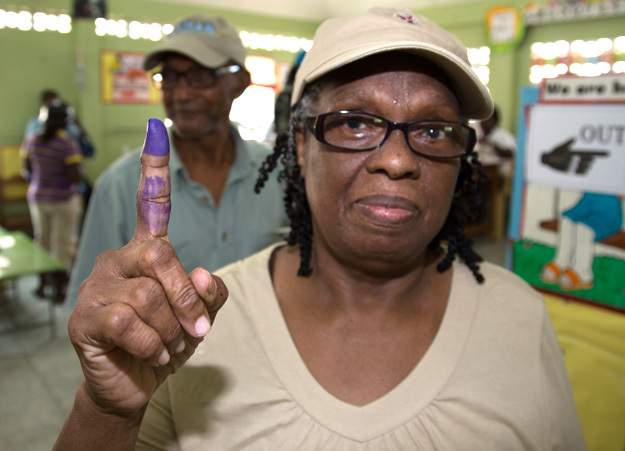 "The two large, ethnically-based parties have long dominated politics in Guyana," explained David Carroll, director of the Carter Center's Democracy Program. "While the population and political scene are changing, the country's electoral and governance systems foster polarization rather than inclusion. "While most political leaders acknowledge the need for constitutional reform, progress has been lacking. The key question is whether serious reforms will proceed after the elections." The Carter Center was invited to observe the May 11 elections - which both the ruling party and the opposition coalition believed they would win - because of its long history in the country. "There's a strong sense that this could be a closely contested election," Carroll said in the days leading up to the contest. "The Carter Center knows Guyana quite well, and the Guyanese are very familiar with the Center's work. We have observed three different elections in Guyana - in 1992, 2001, and 2006 - and we have a deep familiarity with the country's politics and challenges." The Center deployed six medium-term observers in mid-April to assess the political climate and electoral preparations. In the week before the election, they were joined by about 40 short-term observers who deployed across the nation. "This election is likely to be very competitive," said Carroll. "Depending on the quality of the electoral process, there might be reluctance to accept the results. It will be an important test for Guyana and its people." Post-Election Update: The May 11 election was, indeed, a close one. The opposition coalition APNU/AFC defeated the incumbents by less than 5,000 votes. New President David Granger took office on May 16. The Carter Center's observation mission found no major irregularities during the election process. By all indications, the outcome reflected the will of the people.